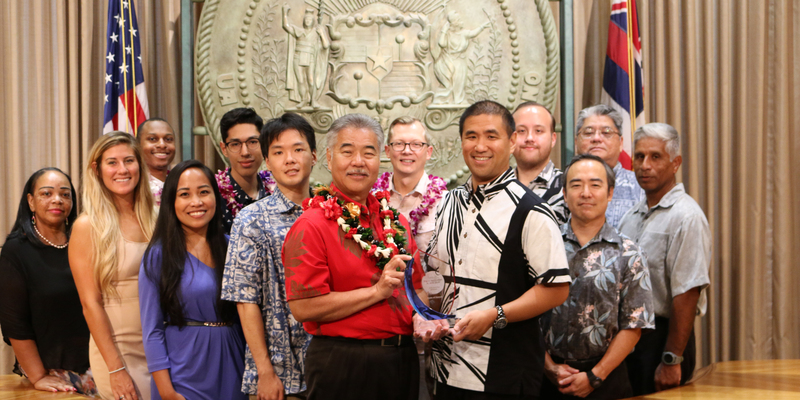 HONOLULU – The State’s Hawaii Department Dashboard has been recognized with the first ever Chaucer Digital Innovation Award in the North America category. An initiative by the Office of Enterprise Technology Services (ETS), the Hawaii Department Dashboard is a strategic roadmap that uses digital visualization to improve the State’s IT governance process and promote organizational change. It also aids with communications and planning of IT projects across State executive branch departments. The Chaucer Digital Innovation Awards seek cutting-edge projects. The award focuses on two categories, North America and International. BMT was given the international award. “The State of Hawaii is our first North American winner for their digital strategic roadmap initiative, which was developed to improve the state’s IT governance process and promote organizational change using a strategic plan by means of data visualization,” said Chris Laslett, CEO of Chaucer. The Dashboard provides an overview of 16 executive State departments’ IT projects and timelines, status and financial breakdowns. The Dashboard, which went live in January, tracks more than $450 million in spend and more than 600 projects. The Dashboard can be found on the ETS website, Hawaii Department Dashboard. As CIO for the State of Hawaii, Nacapuy leads the Office of Enterprise Technology Services (ETS), which provides governance for executive branch IT projects and seeks to identify, prioritize and advance innovative initiatives with the greatest potential to increase efficiency, reduce waste, and improve transparency and accountability in state government. ETS also supports the management and operation of all state agencies by providing effective, efficient, coordinated and cost-beneficial computer and telecommunication services such that state program objectives may be achieved. For more information, visit ets.hawaii.gov.